Today's batch of novels are some of the zig-zags of the Cybils reading list that I've come across thus far. 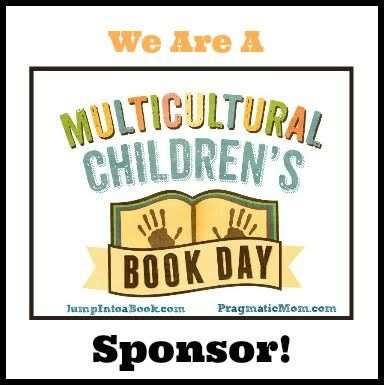 These books start off going one direction, then turn on a dime, giving the reader that little zing of surprise. Mel loves to draw, and Fa Theum loves Mel, so it's no surprise that the priest hangs his sketches. Despite being the son of a poor weaver, in a village where everyone wears dull brown -- because the poor do not have the Pleasure of color, Mel is happy. He dreams, and his wild imagination, even in just plain soot-ink on carefully hoarded white paper from Fa Theum, provides him hours of entertainment. While it's unsurprising that Mel's skill brings him joy, it's astounding to him is how much of a fuss is being made over his sketches. Mel never knew how important art was, and that it wasn't supposed to be enjoyed by the poor, even in black and white. But now that he's an apprentice to the great artist Ambrosius Blenk, he learns that there's more to artwork than meets the eye. Even the pigment is not what he thinks it is... A picture isn't just a picture. It can be a gateway. An escape. It can be everything. London artist Mike Wilks brings his mind-bendingly meticulous artwork to his newest medium of storytelling and opens up a world of clocks and cogs, mechanism and mystery in this suspenseful and unique story. If you're a fan of mysterious, intricate worlds, you'll enjoy Mirrorscape. It drew comparisons to Monster Blood Tattoo, which is a high compliment indeed, so check it out. It's never a good thing to be so behind your classmates that you feel like a freak, so when Laurel finally starts to get acne, in the form of a little blemish in the middle of her back, she actually breathes a sigh of relief. She's always had weird eating preferences, which have worried her parents, but she filled out all right. Maybe now this little spot means that her period is probably on the way. She's fifteen, after all, and it's way past time for all systems to be up and running. It's a great time for a new start, after all, Laurel is attending high school after ten years of homeschooling. And if the cute braniac in biology turns out to be more than a friend, well... the world is full of possibilities. Laurel isn't sure WHAT the heck is going on with her body, but she's frantic -- and desperate and terrified. Turns out that zit sure isn't what she thinks it is. 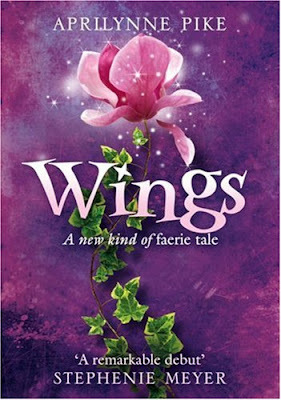 WINGS, by Aprilynne Pike is a fresh tale of fantasy which discards the usual tropes about faeries and elves in place of something unique and fun. It's 100% VAMPIRE FREE! Laurel is an engaging, ordinary high school student who does the best she can with a stunning -- and suddenly dangerous world, and remains true to herself and her friends. I look forward to seeing what else new author Pike will bring to the fantasy scene. There are things which we learn in childhood which are viscerally frightening -- a ghost story will hit us the wrong way, and we'll be unable to sleep for looking at an opening in the closet door. A cousin's whispered story will have us avoiding mirrors after midnight well after all such fears should have faded. In Malice by Chris Wooding, the scary bit is a dark comic. Well, nothing happens. It's just a comic book. It's just a stupid superstition. There is no Tall Jake, and no matter if you burn cat hair or whatever and call him six times, he won't come and take you away. My favorite pink-haired librarian is not in favor of this book, as the cover is 3-D, and it makes it hard to shelve, but this is Goosebumps for the UK set, and horror fans will appreciate it. Strange Angels by Lili St. Crow has already been reviewed here by Aquafortis, but I add it to my "it's not what you think" list for some unexpected twists. The premise - motherless girl, ghoulie-hunting father, vampire-attracting girl -- has kind of been done, most recently in The Devil's Kiss. However this was... somewhat unexpected, and is the beginning of what promises to be a long series. Definitely not vampire or zombie free, but an intriguing book nonetheless. You can find Mirrorscape, as well as Wings, and Malice, and Strange Angels, all 2009 Cybils YA SFF Nominated Books, at an independent bookstore near you! You neglected to include the librarian's pained comment, about Malice: "How is that supposed to fit onto the shelves, hmm?" 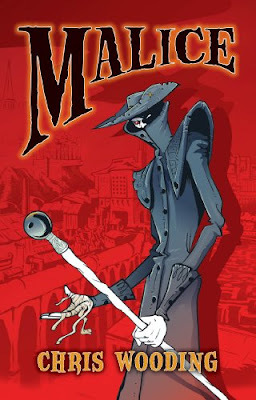 It's not shown in the picture you have, but the UK version has an embedded, plastic ... malicious man on the cover. Shelving? Not Their Worry! I'm interested in Mirrorscape and Wings. Thanks for the mini-reviews. The covers displayed in my library catalog are different from the ones on your blog. It's a pity, because I prefer your Mirrorscape cover. Love the mini-reviews. 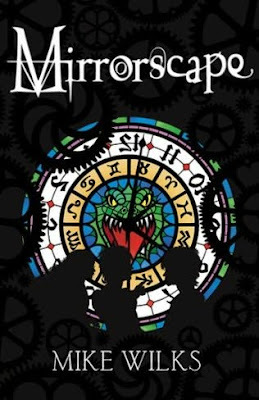 Mirrorscape is looking quite intriguing, especially since you used "mysterious, intricate worlds," I may have to check it out, just for that.